Goodshop App is a tremendously suspicious advertisement-supported program which is most likely to be installed onto your PC bundled with other suspicious programs. Some users think that it is worth taking security risks associated with this adware for the services it provides, but this is not how our malware researchers see this program. Our researchers suggest removing Goodshop App, because it could be a security threat. Learn how to delete this adware by reading our report. The publisher of Goodshop App is identified as GoodSearch LLC. Are you familiar with this name? In the recent past we have created a removal guide for a suspicious program known as the GoodSearch Toolbar. This program has the ability to change default search provider settings and replace the preferred search tools with the suspicious goodsearch.com. On top of that, this program can display GoodCoupons ads, which is why some users delete this toolbar as adware. We now know that this toolbar could also come bundled with the Goodshop App, a program that also requires removal. 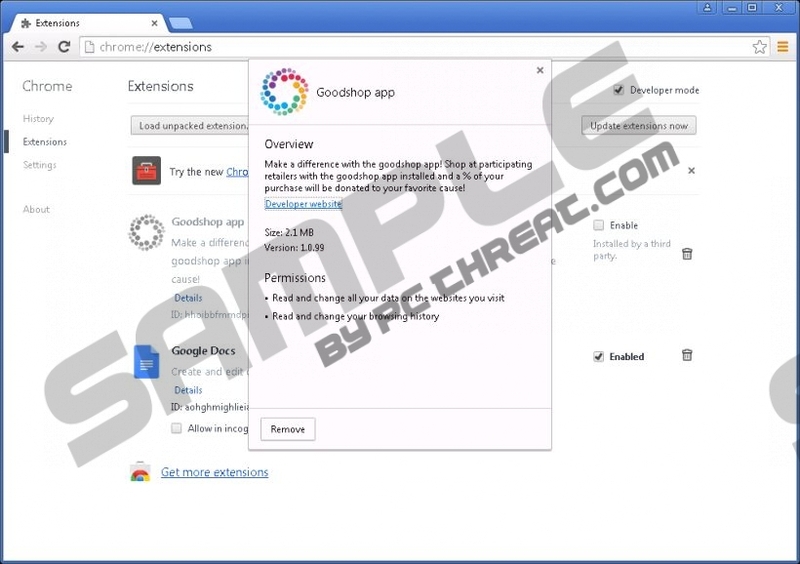 Goodshop App is installed as a browser extension on Chrome, Mozilla Firefox, and IE browsers. Most users don’t immediately realize that they need to delete Goodshop App, because it is presented as a reliable program that can automatically donate a portion of your online spendings to certain causes. This means that Goodshop App can record data about your online purchases, which can be unexpected. If you don’t want to have your activity tracked, you need to delete the tracking cookies responsible for it. It is obvious that Goodshop App could come bundled with GoodSearch software, but it is also possible that this program will come bundled with third-party applications. It is crucial to analyze these programs and learn if they can be trusted. If you research malicious software and inspect it with a reliable malware scanner, we are sure that you will be aware of all unreliable programs, including Goodshop App, that deserve removal. The manual removal of Goodshop App is not difficult. You simply need to uninstall the undesirable program from your operating system, which you can do using the removal guide below. Afterward, you should install an automated remover to delete GoodSearch App leftovers, if they exist, and to delete other infections. If you do not want to invest in a reliable security tool/malware remover, you should at least use a malware scanner and make sure that all threats are deleted manually. Simultaneously tap keys Win+R to launch RUN. Click the Uninstall button to delete the undesirable program. Click the Start icon on the Taskbar. Find the undesirable application, click it, and select Remove. Launch the browser and tap Alt+T (Tools menu). Click Manage Add-ons and move to Toolbars and Extensions. Select More Tools, click Extensions, and find GoodSearch App. Click the recycle bin icon on the left and select Remove. Click the Remove button next to the undesirable add-on. Quick & tested solution for Goodshop App removal.